KANSAS CITY -- JULY 25, 2013 -- It is always unsettling to hear reports of care center abuse or nursing home abuse, but in many situations the incidents are isolated. The problem is often with one or two staff members at a home who have committed care home abuse. So reading about situations in which dozens of employees at one care home are charged with abuse can be shocking. 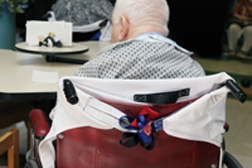 The Inquisitr (7/2/13) reports that 21 employees at a Georgia nursing home have been charged after a three-month-long investigation into activities at the Alzheimer’s Care of Commerce. The 21 employees face more than 70 charges related to alleged physical abuse, neglect and financial exploitation of residents of the home. Associated Press (7/2/13) reports that employees were alleged to have hit patients and thrown water on them. Three residents of the home were hospitalized after authorities raided the home. Authorities reportedly first learned of problems at the home when an employee complained. Included in those charged is the owner of the home. A 2001 Congressional report, titled Abuse of Residents Is a Major Problem in U.S. Nursing Homes warned that early one in three U.S. nursing homes was cited for an abuse violation from January 1, 1999 through January 1, 2001. In all, 5,283 nursing homes received a citation for an abuse violation, for a total of 9,000 abuse violations. Each of these violations had the potential to result in harm to residents, and in 2,500 violations, nursing home residents actually did suffer harm or were placed in jeopardy of death. Included in the violations were reports of physical, sexual and verbal abuse, including one nursing home attendant hitting a resident in the face and breaking the resident’s nose; nursing home employees hitting a resident with a belt, locking him in a bathroom and hitting him in the head with a book; a nursing home failing to protect residents from a violent resident who had 50 instances of abusive behavior; a nursing home attendant sexually abusing residents; and nursing home staff verbally abusing residents.